Mucus is a thick fluid secreted by mucus cells that are located in various organs. Mucus acts as a protective barrier and filter by coating the lining of organs to trap foreign substances. When foreign substances become trapped in the mucus, they cannot invade the body and cause sickness. 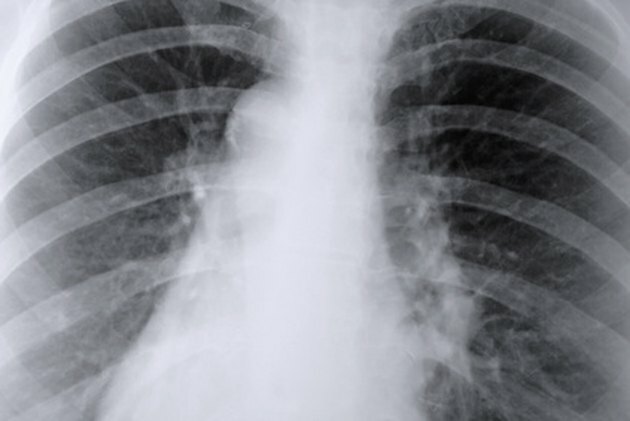 A number of lung diseases can cause too much mucus to build up in the lungs. When mucus accumulates in the lungs, it can cause a mucus-filled cough and difficulty breathing. Asthma is characterized by chronic inflammation of the airways that move air into and out of the lungs and an increase in mucus production by the cells in the airways. When the airways are inflamed, they narrow. The excess mucus can also accumulate in the airways, which causes them to narrow further. The narrowing of the airways results in difficulty breathing. In addition to breathing difficulty, other asthma symptoms include wheezing, chest tightness, shortness of breath and coughing, according to the National Heart, Lung and Blood Institute. Asthma is treated with two types of medications: rapid-acting and long-acting. Rapid-acting medications relieve symptoms almost immediately and are used during asthma attacks. Long-acting medications work by increasing the diameter of the airways and are used over an extended period of time. Cystic fibrosis is an inherited chronic lung disease characterized by the accumulation of mucus in the lungs and digestive tract. The mucus produced in those with cystic fibrosis is extra thick and sticky and builds up in the airways of the lungs. The accumulation of mucus results in an increased chance of developing serious lung infections and digestive problems, according to Medline Plus. The disease is caused by a defective gene that is inherited from both parents. Symptoms of cystic fibrosis depend on which defective gene is present in the affected individual. These symptoms include delayed growth, stomach pain, constipation, nausea, loss of appetite, weight loss, coughing, nasal congestion, fever and sinus pain. Treatment for cystic fibrosis includes medications, enzyme replacement therapy and oxygen therapy. Lung transplantation may be an option in specific cases. Even with treatment, those with cystic fibrosis have a decreased life expectancy. Bronchitis is characterized by inflammation of the lining of the airways of the lungs. There are two types of bronchitis: acute and chronic. Acute bronchitis is often a complication of a cold or respiratory infection. Chronic bronchitis is a constant inflammation that is considered a type of chronic obstructive pulmonary disease and most often a result of smoking, according to MayoClinic.com. Symptoms of bronchitis include increased production of mucus, cough, shortness of breath, wheezing, fatigue, fever and chills. Those with chronic bronchitis will also experience recurrent respiratory infections. Treatment for bronchitis consists of medications and pulmonary rehabilitation.